For the album by Lorrie Morgan and Sammy Kershaw, see I Finally Found Someone (album). "I Finally Found Someone" is a song duet from 1996 with Canadian artist Bryan Adams and American artist Barbra Streisand. The song was part of the soundtrack of Streisand's self-directed movie The Mirror Has Two Faces and was nominated for an Oscar. It reached No. 8 on the Billboard Hot 100, and #2 on the Hot Adult Contemporary chart. "I Finally Found Someone" gave Streisand her first significant hit in almost a decade and her first top 10 hit on the Hot 100 (and first gold single) since 1981. The song was included on several reissues of Adams' album, 18 Til I Die. The reissues can be identified by having a purple cover, instead of an orange one. Several versions of a CD single were issued on its initial release. One contains a rare Spanish-language version of her 1976 song "Evergreen", as well as Adams' previous single "Let's Make a Night to Remember". Another version includes three solo recordings by Adams from his most recent album. Barbra Streisand told The Los Angeles Times in 1996: "I wrote the love theme, the main love theme, then Marvin wrote a bridge to it, and that was going to be our song. Then David Foster had the idea that I should sing the duet with Bryan Adams. Bryan played our track and heard me humming and fell in love with this little theme that I wrote, and then he and his producer Mutt Lange wrote a counter melody based on the track that I sent him. And they wrote the lyrics. So that's how that happened. I don't think his record company wanted him to sing with me...because I'm more traditional, and I haven't had a hit since I don't know when." A video clip was made of the single, which consisted of promotional shots of the pair and clips from the film, as well as documentary shots of Streisand directing. 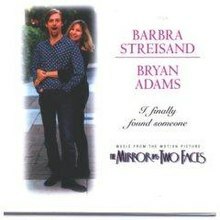 The song was played during the end credits of the 1996 film The Mirror Has Two Faces, which Streisand directed. Upon Hamlisch's death, Adams tweeted "We co-wrote the Oscar- nominated song, 'I Finally Found Someone' (a No. 8 Hot 100 Adams- Streisand duet for her 1996 film The Mirror Has Two Faces). He was an amazing musician-composer and will be missed." The academy had originally wanted Streisand to sing "I Finally Found Someone" and asked her, however Streisand declined the opportunity to perform the song at the Oscar ceremony. Various publications speculated that Streisand had snubbed the Academy due to her film not being nominated for Best Picture. Natalie Cole was asked to step in to replace her but she became sick just before the show. As a result, Streisand offered to resume her role, but Oscar producers had already asked Celine Dion to do it instead. Streisand had been told that Dion had already started rehearsing the song along with Because You Loved Me, which she was also set to perform. The director of the Oscars, Louis Horvitz, said that "Barbra called us after saying no several times, but the ship had sailed". Meanwhile, Streisand said that Dion would "be wonderful" and that "she can have the butterflies, not me". Streisand ended up taking a bathroom break while Dion performed the song, which led to press speculation of Streisand's divaness and the two singers feuding at the ceremony. Billboard would describe this event as a "faux media scandal". Nevertheless, the singer later apologised and claimed that the performance schedule was not made clear on the program. The Record said Streisand's decision not to perform despite being in the audience was an "especially strange development". The pair met during a commercial of the show, wherein Streisand invited her to sing a duet, a project that ultimately became Tell Him, which gave her a second Grammy nomination in the Best Pop Collaboration with Vocals category for the 1998 ceremony alongside its inspiration I Finally Found Someone. The National Post noted that at a 2012 Montreal concert, the singer "feigned surprise and 'struggled' to remember the song" despite it being listed in the program beforehand; they attributed this to her "incomparable professionalism". She performed the song with Il Divo in her 1996 U.S. and Canadian tour. Moviefone deemed the song a "generic power ballad", and described Adams as " similarly overwrought". Boca Raton News described it as a "big music hit". 'The Washington Post wrote the Adams "speak-sings his way through" the song while Streisand is unrestrained. The Buffalo News said Streisand is "fascinating" on the song. The Virginian Pilot deemed it "devoted". Star Tribune thought it was "stagily romantic" in which Adams is "full of purring sweet talk but doesn't really throw any sparks". The Mirror said the song is one of the few pieces that redeem the score to The Mirror has Two Faces." The song debuted on the Billboard charts on November 23, 1996. It stayed on the Hot 100 Singles Chart for 20 and achieved a Peak Chart Position at #8. The song reached Gold on January 8, 1997 having had 1 million copies sold. The song was nominated for Best Pop Collaboration with Vocals Nomination as a duet with Bryan Adams. The song gave Marvin Hamlisch his last Oscar nomination. The song became Streisand's second Best Song nomination (writing credit) at the Oscars after Evergreen in 1977. The song was covered by country music artists Lorrie Morgan and Sammy Kershaw on their 2001 album I Finally Found Someone. Celine Dion performed the song live at the Academy Awards show in 1997 with a brass instrument being performed in the Bryan Adams's part, since Streisand was unable to perform. The trumpeter who accompanied Celine Dion during the song will be pointed by certain medias for having played 'too loud'. Celine Dion became with this song the only female artist to have the privilege to sing twice during the Academy Awards show. Dion was nominated for her own single "Because You Loved Me" in the same category that year, though they both lost to "You Must Love Me" from Evita. ^ Whitburn, Joel (2002). Top Adult Contemporary: 1961-2001. Record Research. p. 16. ^ "Barbra Streisand interview". The Los Angeles Times. 1996. ^ "Barbra Streisand Archives | I Finally Found Someone | Music Video". barbra-archives.com. Retrieved 2016-09-07. ^ "MIRROR REFLECTS STREISAND'S TALENTS, FLAWS. (DAILY BREAK)(Review)". 1996-11-16. Archived from the original on 2016-02-24. ^ "Steve Smith: Hey, Hey, We're the Monkees and We're Going on Tour". 2012-08-09. Archived from the original on 2016-10-08. ^ "Garth Brooks to stage free concert in Central Park". 1997-03-28. Archived from the original on 2016-10-08. ^ "Hollywood buzz // Big opener is Crystal clear". 1997-03-24. Archived from the original on 2016-10-08. ^ "NEWS LITE : ADULTRY TOPS LIST OF TV SINS.(News)". 1997-03-24. Archived from the original on 2016-10-08. ^ Marcano, Tony (1997-03-24). "CHRONICLE". The New York Times. ISSN 0362-4331. Retrieved 2016-09-07. ^ "NEWS LITE : N.Y. MAYOR POPULAR IN DRAG GIULIANI'S CROSS-DRESSING ACT BIG HIT, POLL SHOWS.(News)". 1997-03-28. Archived from the original on 2016-10-08. ^ "STREISAND EXPLAINS HER DISAPPEARANCE AT OSCARS.(News/National/International)". 1997-03-28. Archived from the original on 2016-10-08. ^ "Bun fight of the vanities". 1998-03-22. Archived from the original on 2016-10-08. ^ "THE WAY THEY ARE". 1997-11-14. Archived from the original on 2016-10-08. ^ Inc, Nielsen Business Media (1998-02-28). Billboard. Nielsen Business Media, Inc.
^ "WHEN YA GOTTA GO, YA GOTTA GO.(NEWS)". 1997-03-28. Archived from the original on 2016-10-08. ^ "Barbra Streisand Archives | TV | 69th Academy Awards (1997 Celine Dion)". barbra-archives.com. Retrieved 2016-09-07. ^ "Grammys Headache: Flu KO's Streisand". Retrieved 2016-09-07. ^ "THE BUZZ". 1997-03-25. Archived from the original on 2016-10-08. ^ "TOO GOOD TO WAIT; CELINE DION CITES GOOD SONGS IN DECISION TO SPEED RELEASE.(L.A. LIFE)". 1997-11-11. Archived from the original on 2016-10-08. ^ Inc, Nielsen Business Media (1997-11-01). Billboard. Nielsen Business Media, Inc.
^ "DION AMONG THE STARS The Canadian superstar sings with Pavarotti and Streisand on her new CD". 1997-11-14. Archived from the original on 2016-10-08. ^ "NEWS LITE : 007 STAYS ON HER MAJESTY'S BLACKLIST.(News)". 1998-02-23. Archived from the original on 2016-10-08. ^ "NEWS LITE : 'TITANIC' GROSSES RECORD $919.8 MILLION GLOBALLY.(News)". 1998-02-25. Archived from the original on 2016-10-08. ^ "The Post Files". 1998-02-25. Archived from the original on 2016-10-08. ^ "GRAMMY AWARDS '98.(L.A. LIFE)". 1998-01-07. Archived from the original on 2007-01-03. ^ "Concert review: Barbra Streisand in Montreal". Retrieved 2016-09-07. ^ "Barbra Streisand's 2006 Tour". www.barbranews.com. Retrieved 2016-09-07. ^ Staff, Moviefone (2012-04-23). "Barbra Streisand Movies: Grading The Star's Hollywood Career". AOL Moviefone. Retrieved 2016-09-07. ^ "Boca Raton News - Google News Archive Search". news.google.com. Retrieved 2016-09-07. ^ "'Duets': Streisand's One-Two Punch". 2002-12-01. Archived from the original on 2016-10-08. ^ "O,MUSIC TREE THESE CD SOUNDS DELIGHT US". 1996-12-09. Archived from the original on 2016-10-08. ^ "CD REVIEWS: ON JAE SINNETT'S LATEST, EVERY GROOVE IS DIFFERENT. (DAILY BREAK)". 2003-01-17. Archived from the original on 2016-10-08. ^ "Inside; Videos: Monstrous.(ENTERTAINMENT)(Review)". 1996-12-22. Archived from the original on 2016-10-08. ^ "Soppy Marvin's right out of step; SOUND TRACKS.(Features)". 1997-01-09. Archived from the original on 2016-10-08. ^ a b "Barbra Streisand Archives | 7-inch 45 rpm Singles | I Finally Found Someone (Duet with Bryan Adams)". barbra-archives.com. Retrieved 2016-09-07. ^ Harmetz, Aljean. "Obit: 'Chorus Line' Composer Marvin Hamlisch Wrote for Film, Theater and TV –and Streisand | IndieWire". www.indiewire.com. Retrieved 2016-09-07. ^ Kagan, Jeremy Paul (2006-01-01). Directors Close Up: Interviews with Directors Nominated for Best Film by the Directors Guild of America. Scarecrow Press. ISBN 9780810857124. ^ "Australian-charts.com – Barbra Streisand & Bryan Adams – I Finally Found Someone". ARIA Top 50 Singles. ^ "Austriancharts.at – Barbra Streisand & Bryan Adams – I Finally Found Someone" (in German). Ö3 Austria Top 40. ^ "Ultratop.be – Barbra Streisand & Bryan Adams – I Finally Found Someone" (in Dutch). Ultratop 50. ^ "Ultratop.be – Barbra Streisand & Bryan Adams – I Finally Found Someone" (in French). Ultratop 50. ^ "Lescharts.com – Barbra Streisand & Bryan Adams – I Finally Found Someone" (in French). Les classement single. ^ "Offiziellecharts.de – Barbra Streisand & Bryan Adams – I Finally Found Someone". GfK Entertainment Charts. ^ "Íslenski Listinn Topp 40 (26.12.1996 - 08.01.1997)" (PDF) (in Icelandic). Dagblaðið Vísir - Tónlist. Retrieved 2018-02-05. ^ "Hit Parade Italia - Indice per Interprete: A". Hit Parade Italia. Retrieved July 6, 2012. ^ "Nederlandse Top 40 – Barbra Streisand & Bryan Adams" (in Dutch). Dutch Top 40. ^ "Charts.nz – Barbra Streisand & Bryan Adams – I Finally Found Someone". Top 40 Singles. ^ "Swedishcharts.com – Barbra Streisand & Bryan Adams – I Finally Found Someone". Singles Top 100. ^ "Swisscharts.com – Barbra Streisand & Bryan Adams – I Finally Found Someone". Swiss Singles Chart. This page was last edited on 14 March 2019, at 20:16 (UTC).